A series of field trials were completed to inter-compare ground deposition from ground and aerial sprays of Fyfanon® ULV adulticide and to compare these results with others predicted by AGDISP. A ground cold-aerosol generator (Clarke GRIZZLY) was used in wind conditions ranging from 3.6 to 12.4 kph. Deposit samples (fiberglass filters) were taken at 10 m intervals to 500 m downwind. 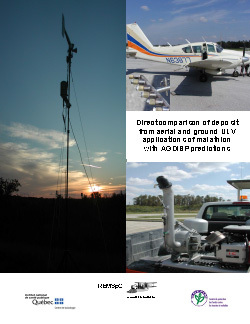 Collocated at alternate sites, the spray cloud at 1.4 m height was characterized using rotating 3 mm rods to measure drop density and size within the cloud. Aerial trials using PJ20 high-pressure nozzles were completed in winds of 17-25 kph at spray height (60 m). Ground deposit was measured at 100 m intervals to 5 km while the spray cloud was characterized at 200 m intervals.